Retail Shops please contact me using the link in the upper right corner regarding wholesale orders. This collection is offered for sale in three ways to fit your budget and needs. Your purchase includes an instant download of the eBook, shipping, and a signed copy of Leaves, Fickle Knitter Design Volume 1. Orders ship right now!. Your purchase includes an instant download of the eBook, shipping, and a print copy of Leaves, Fickle Knitter Design Volume 1. Orders ship right now!. Only want the PDF version? Your purchase includes an instant download of the eBook delivered immediately to your inbox. Also available for sale on ravelry and etsy. 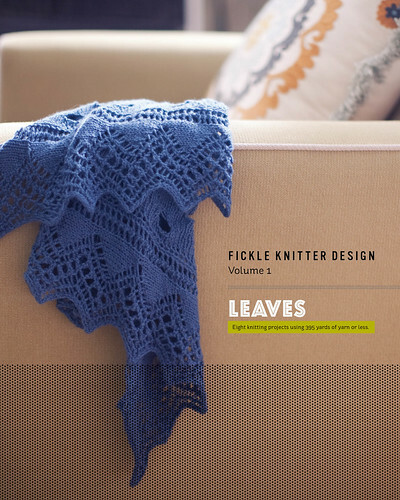 Leaves, Fickle Knitter Design Volume 1 is 32 pages long with 8 projects that use 395 yards of yarn or less. The book has been professionally tech edited, test knit, showcasing the knitting patterns with high end photography and graphic design specifically with the knitter in mind. The book contains 4 shawls, a top down beret, a wristlet bag, easy slippers, and a cowl. These projects promise to delight the knitter and knit up quick and are great for Christmas knitting for your friends and family or yourself. Buy your copy today! nao? is it ready nao? Excited about the book. What’s the eta on publication? I love the little bag that expands with purchases, I plan on making these little things for Holiday Presents!!! However, I just love the beret and need it for myself after the presents to others are finished… and I have the perfect yarn for it… and yes it is a treasure from a trip to the Renaissance Fair so the amount should be just perfect. Is there a place to pre order? I would love to partner your book with my hand dyed yarns! Email me using the contact form on the side and I’ll get you set up.